You can download the sample Economics essay on Intermediate Microeconomics Assignment with the following question for free at the end of this page. For further assistance with Economics Assignment help, please check our offerings in Economics assignment solutions. Our subject-matter experts provide online assignment help to Economics students from across the world and deliver plagiarism free solution with a free Turnitin report with every solution. Problem 1. Markets: Perfect Competition. Assume that a perfectly competitive, constant cost industry is in a long run equilibrium with 20 firms. Each firm is producing 150 units of output which it sells at the price of $20 per unit; out of this amount each firm is paying $4 tax per unit of the output. The government decides to abolish the tax. a) Explain what would happen in the short run to the equilibrium price and industry output; number of firms in the industry; output and profit of each firm. Illustrate on diagrams for the market and a particular firm. b) Explain what would happen in the long run to the equilibrium price and industry output; number of firms in the industry; output and profit of each firm. Illustrate on diagrams for the market and a particular firm. Compare both to the initial long run equilibrium and to the short run equilibrium. Problem 2. General equilibrium: Efficiency in the Edgeworth box. a) Draw the Edgeworth box for Xiao Ping and James. 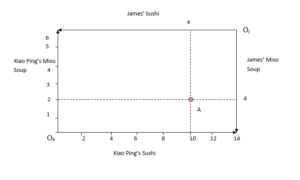 Please put Xiao Ping at the origin and James “upside down”; put sushi on the horizontal axis and miso on vertical. Show their endowment point. 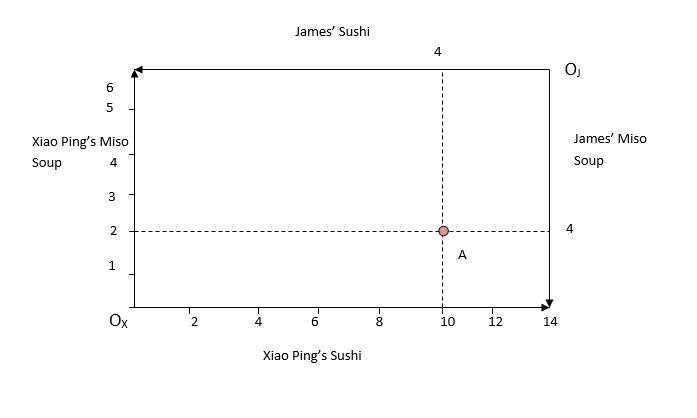 b) Show all Pareto optimal allocations of miso and sushi between Xiao Ping and James in the Edgeworth Box. Please note that this question is a bit tricky, though not difficult. Draw a bunch of indifference curves and look for tangencies. It is given that industry comprising of 20 firms has constant costs and is in long run equilibrium under perfect competition. Each firm is producing 150 units of output, which it sells at the price of $20 per unit; out of this amount each firm is paying $4 tax per unit of the output. The government decides to abolish the tax. a) Initially, the firms received $16 ($20-$4) for each unit of output and there was zero profit in the long run equilibrium. The market price for each unit was P= MC1 + tax = 16 + 4 = $20. As the tax is abolished, the price received by each firm for one unit of output becomes $20 which is now equal to the market price. The MC and AC of an individual firm shift vertically upwards while the amount of output remains constant at 150 units. Hence, in the short run, the firms start earning a profit ($4 X 150= $600) due to the rise in price. This positive profit poses as an incentive to other firms to join this industry and the number of firms starts increasing gradually in the short run. 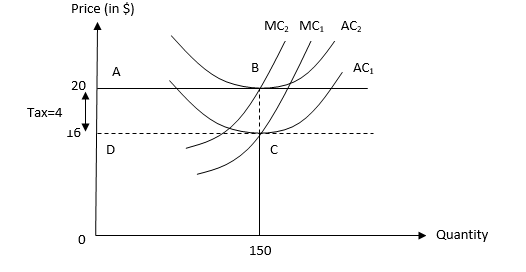 The above diagram (Fig.1) shows the equilibrium price ($20) and output (150) for a particular firm. 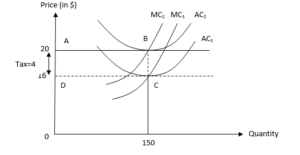 The firm’s supply curve is given by the MC lying above the AC. Here, the total amount of profit accrued by the firm is equal to the rectangular area enclosed by ABCD. Xiao Ping and James always eats miso soup and sushi in exact proportions – one miso per two sushi. They throw away any extra soup or sushi as it would not give them any pleasure. Once, they were stuck in the office together for hours, marking students’ assignments. Xiao Ping had 2 miso soups and 10 sushi with him; James had 4 miso and 4 sushi. Here, OX is the origin for Xiao Ping and OJ is the origin of James. Point A in the diagram shows Xiao’s and James’ initial endowment point which is given by the coordinates (10, 2) for Xiao Ping and (4, 4) for James. This entry was posted in Economics and tagged Economics, equilibrium price, equilibrium under perfect competition, Intermediate Microeconomics Assignment, long run equilibrium, market price, short run supply curve. Bookmark the permalink.